Today’s post is something of a thought experiment. 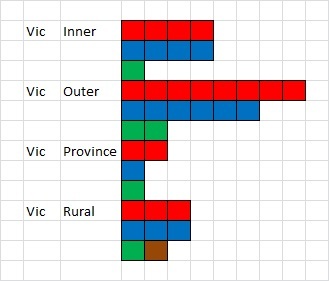 I have long wondered what an Australian House of Representatives would look like using an electoral system like the Hare-Clarke system, which is what is used in the state elections for both Tasmania and the ACT. Since it’s incredibly late for me, and I’ve spend most of my blog time crunching the numbers on this, this will be a much shorter article than normal. My reasoning goes that the Federal system is supposed to be a large centralised polity, but one which responds to significant national issues. The fact that lower house seats are tethered to discrete geographies is something of a relic of 19th Century democracy, where the sort of direct representation was necessary in the context of poor telecommunications. However, in the 21st Century, communities are being decreasingly bound along the discrete geographic lines that the electoral divisions produce. Moreover, they are dependent on the first past the post system, which is one of the features that reinforces the dominance of the two party system. Increasingly, we are seeing political communities wrapped around partisan lines, which transcend partly over divisional boundaries. As a population we are also increasingly mobile and better connected than we have been in our entire history. Certainly, the rise of the internet is impacting the way we configure our communities. Without being able to go into greater depth than that tonight, these reasons all allude to why I feel something similar to the Hare-Clarke system is more reflective of the types of democracies relevant to a digital and information age. Inner metropolitan, means located in a capital city and comprising well-established, built-up suburbs. Outer metropolitan, means located in capital cities and containing areas of more recent urban expansion. Provincial are divisions with a majority of enrolment in major provincial cities. 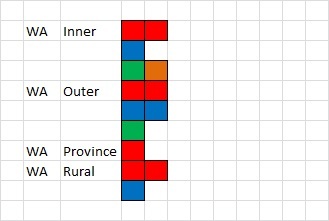 Rural are divisions without a majority of enrolment in major provincial cities. I believe this choice to be a sensible one, because these demarcations still represent something of the distinctive lifestyles and communities found across Australia. 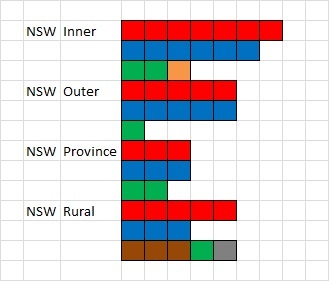 Though it would be erroneous to say that the concerns in Newcastle and Wollongong are identical merely because they are both provincial, they have far more in common with each other that is relevant to Federal polity, than other demographics. I felt that this demarcation would help reflect a diversity of community needs and voices. Of course, there are some States and Territories that either lack some of these categories, or contain only one example of these categories. 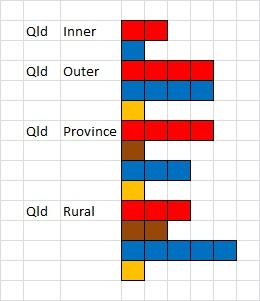 Of note both the ACT’s divisions are Inner Metropolitan, so I treated them as one electorate. 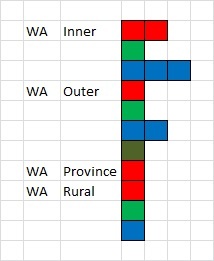 Tasmania has five electorates, but only one of Inner Metropolitan, Outer Metropolitan, and Provincial; Western Australia has only one Provincial division; and the Northern Territory has one Inner Metropolitan and one Rural division. In these instances I just used the result from the 2010 election, because that was simpler and those divisions would effectively be a first past the post system. Finally, South Australia has no Provincial Divisions. In terms of determining preference slows, I did a big cheat. I basically allocated preferences according to the Single Transferable Vote method, as per the Senate, but allocated all of those flows according to the Group Ticket Vote preferences for each state of that year. 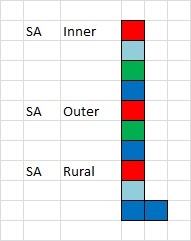 Naturally, in order to make an accurate picture of the Hare-Clarke system, I could use the AEC’s data on preference flows for each polling booth, but that prospect is incredibly daunting and even this method took a fair amount of time. 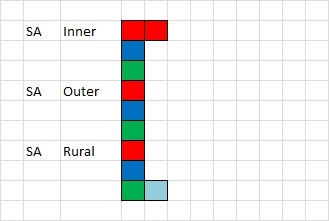 The Greens gain a seat on quota in Inner Metro, the remainder are from preference flows from Labor. CDP gains a seats from Liberal Party and other minor party preferences. 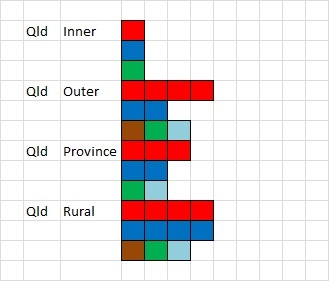 Greens gain seats on quota in the Inner and Outer Metro areas, and the remaining on preference flows from Labor. 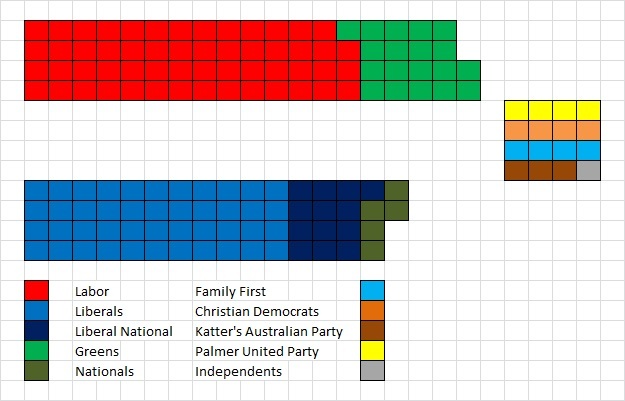 All Family First seat are gained through Liberal-National preference flows. All Greens seats are gained through Labor preference flows. The Christian Democrats gain a seat through a number of minor party preference flows. The Greens gain seats through preference flows from the Labor Party respectively. 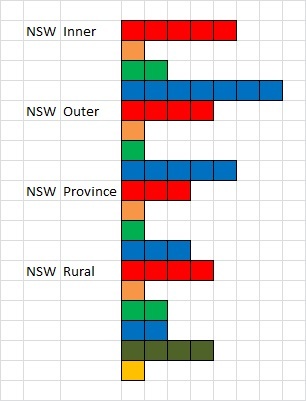 All seats gained by Family First and the Greens are dependent on preference flows from the Liberal Party and Labor respectively. ALP elected on quota, LP depend on preferences.